Kiss might be playing arenas on the opening leg of their End Of The Road tour, but they made a special appearance at the legendary Whisky A Go Go on the Sunset Strip last night. 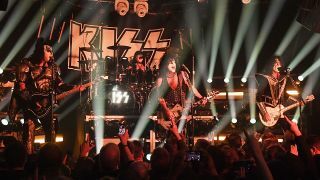 The intimate show was an invitation-only only event for SiriusXM subscribers – and it was Kiss’ first US club performance in 20 years. It was also the first time the rock icons had played the famous Los Angeles venue. Speaking to the crowd before the band launched into Cold Gin, Paul Stanley said: “It’s so cool because right now we’re on the End Of The Road tour, so we’re playing all the arenas – and to be able to go back and relive what we did once upon a time, is pretty awesome. Footage from the show has emerged online and can be watched below. Kiss kicked off their mammoth final tour in Vancouver earlier this month in spectacular style, playing a selection of their classic tracks including Detroit Rock City, Shout It Out and Love Gun. The band’s next show will take place in Anaheim later tonight (February 12) with the first leg of their North American tour wrapping up on April 13. Kiss will then return to Europe throughout the spring and summer before heading back across the Atlantic for further shows.